My family has been huge fans of the cheese platter for years now. It started when I was like 12 or 14 when my mom made a wrapped brie appetizer for the holidays. Not that cheese wasn’t a huge part of my life prior to this event. I am from the Midwest where dairy has its own sacred place in the food lexicon, but this was the first time that I’d experienced anything outside of the hard block of yellow or white cheese. Since then, there have been numerous cheese platters. Some stand out more than others and while the cheese is definitely the highlight, it also has to do with who you are sharing it with and what you choose to go along with it. Early this spring my sister and her boyfriend came down for a visit from Seattle and we decided to check out Steve’s Cheese for the first time. Don’t ask me why it took me so long to get over there, but it was years wasted in my opinion. 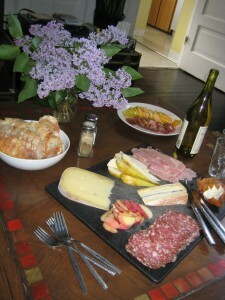 The cheese and cured meats selection was wide and diverse and the service was exceptionally helpful and knowledgeable. The cheese platter we ended up with – largely made up of recommendations – was delightful. I don’t know what other word to use. We paired the cheese and meat with some bread and vegetables that we had picked up at the farmer’s market so we were truly fulfilling the northwest food geek stereotype. We had three different cheeses all from the pacific northwest. They are all well known cheese makers and I’ve run into these cheeses since then at cheese tastings and counters around town. That said all three are really delicious representations of pacific northwest cheese. The Willamette Valley Cheese’s Boerenkass (a raw cow milk cheese) was mild, but really full of flavor and went really well with the bread and Fra Mani Sopressata. This was the first time that I had tasted Rivers Edge Chevre’s Up in Smoke (goat milk). This was unbelievably fantastic. I love goat cheese and I’ve never tasted a goat cheese like this – rich, smoky, creamy. I’ve had this over and over again since this first tasting. I liked eating it wrapped in the Iowa applewood smoked durroc ham we got from Steve’s Cheese. The final cheese was from Estrella Family Creamery. I first had their cheese after visiting the Ballard farmer’s market so this was not a new cheese maker for us, but it was the first time I tasted their Guapier (cow milk). This cheese has a layer of ash running through the center separating the morning and evening milking. There really was a stark difference in taste between the two sides and it made for a fun tasting. It was a really delicious cheese that was really best – in my opinion – eaten by itself. This was one of those really great cheese experiences. The company was fun and casual and into the cheese. And the cheese lived up to the moment with great flavors. That last one sounds really interesting! Might have to pick some of that up this weekend. Ile de France Cheese, is holding a new contest! The grand prize winner will receive $1000.00 cash; 2nd and 3rd place finishers will each win an Ile de France Cheese basket worth $150. To participate, simply send us your Ile de France Cheese recipe, pairing pictures, or video with the recipe text itself.